To create vibrant centers for learning which provide a congenial atmosphere for students to excel academically and develop into ethically strong and morally elevated individuals. 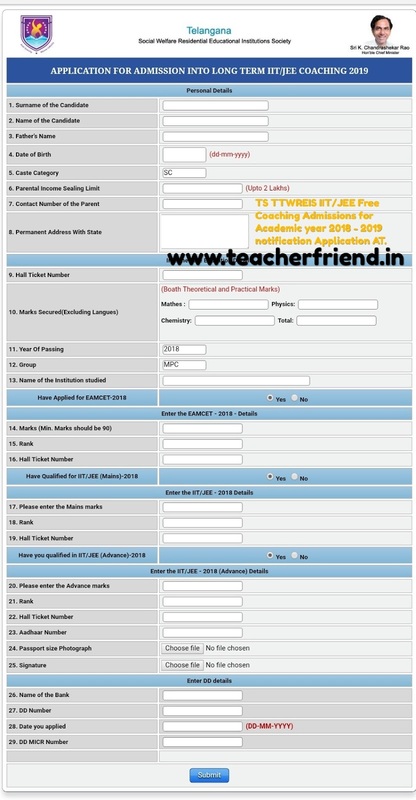 TS TTWREIS IIT/JEE Free Coaching Admissions for Academic year 2018 notification,Online Application at www.tgtwgurukulam.telangana.gov.in/. Our mission is to partner effectively with the efforts of our students and ensure that they succeed and turn out to be responsible citizens of our country, good resources for the development of the nation and faithful family members. Our mission is to empower the child use his/her own academic, physical, mental, spiritual and emotional potential and channelize them for the welfare of the individual and the society as a whole. 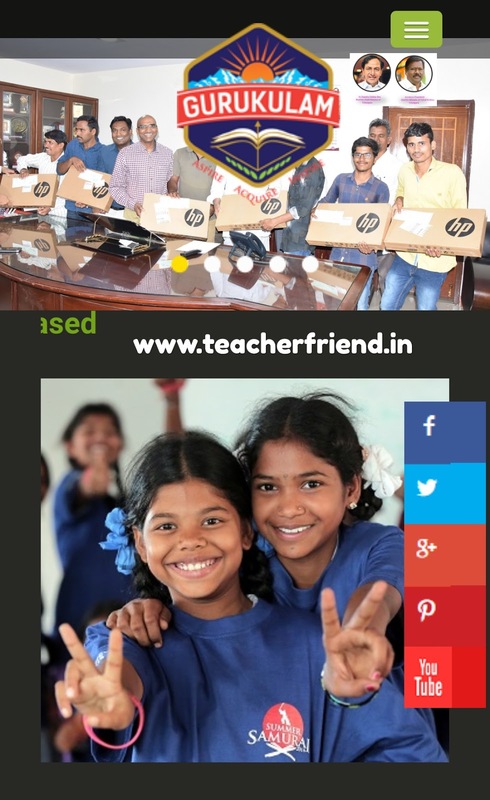 Our vision is to outreach and help every child outperform in the best possible way and extend our contribution in actively serving and improving our community for a better tomorrow. The academic perspective of Gurukulam is to create vibrant centers for learning which provide a congenial atmosphere for students to excel academically and develop into ethically strong and morally elevated individuals. Our vision is to outreach and help every child outperform in the best possible way and extend our contribution in actively serving and improving our community for a better tomorrow. The institutions functioning under Telangana Tribal Welfare Residential Educational Institutions’ Society known as Gurukulams aim at delivering the academic standards as per the set standards. To meet the desired expectations, Gurukulam has also included various activities and initiatives into the curriculum and has thus customized it. The customized curriculum caters to the all-round development of the individual bridging the gap with respect to the current advancements. Curriculum as we are very well aware is broadly defined as the totality of student experiences that occur in the educational process. The thus devised curriculum and the approaches that suit the learning needs and environment has given rise to the TTWREIS Academic Calendar of Events. It chronicles all the events and happenings at the institutional level which are inclusive of Daily routine on a working day and a holiday which has to be very rigorously followed, Morning Assembly Procedure, Observance of Important Days & Occasions, Academic Programme constituting Scholastic and Co-Scholastic activities, Tests & Exams and Administrative Activities . The calendar comprises of a list of curricular and extra-curricular activities and serves as a facilitator for the student as well as the Principal/teacher for a smooth functioning of the system. This calendar of events aims at uniformity and accord across all institutions of the TTWREI Society. My School, TTWR School, Balanagar, I feel, is one of the best schools in Mahabubnagar district. It is a very convenient point as it is situated on the national high way and the ambience of the school is quite inviting and welcoming. I took admission in VI class in this school in 2012 with an ambition to become a teacher. Later I got selected for Civil Service Foundation Course in IX class. This was the turning point of my life as my goal shifted from IAS to IPS with the inspiring words of our beloved Secretary Sir. I remember the great quotation, "Think like Genius, Work like Giant and Live like a Saint." My school offers everyone to take part in many activities like games and sports, E-plus Club, Youth Parliament, Ignite Fest, W-Plus Club, dancing, singing etc. I am fortunate enough to be one of the School Council members and the Literary Secretary of the Emerald Group. Students of every class in our school are divided into four groups like Sapphire, Ruby, Emerald and Topaz. Many competitions are being held among these groups. I got the opportunity to participate in Synergy and Summer Samurai. My parents also felt happy for participating in the IMPACT programme. My school is the best with best ttrainings who are very friendly and at same time tune us to be more disciplined and shower us with parental affection. That is why I love my school very much and I am very proud of it. The IIT Study Centre for STs has been established under the aegis of Gurukulam, Tribal Welfare, Government of Telangana in the academic year 2011-12. The Study Centre is residential in nature. The centre has been set up with a view to achieve academic standards of tribal students so that they will secure into the premier institutions such as IIT, NIT, JIPMER, AIIMS etc. and so on. Colleges of Excellence at Warangal and Mannanur have been established (co-education) with MPC and BiPC groups with 40 ST students in each group with English medium vide G.O.Ms.No:55, SW (TW Edn.II) Dept., dt:06-07-2006. Rs. 100/- for each application in shape of Demand Draft (DD) in favoring to SECRETARY, TTWREIS,HYDERABAD payable at Hyderabad. the DD submitted at the time of admission. Online application start from 19.07.2018. Last date for submission of application through online is 31.07.2018.